Replacing your windows is a large investment, but we believe the benefits and features that new, modern windows offer outweigh their initial price. Don’t believe us? Here are 5 Facts that prove our point! Fact #1: Today’s new windows make life much easier. Modern day mechanical components mean windows don’t stick or squeak, while materials like vinyl/thermal frames make window maintenance such as painting and caulking completely unnecessary. Plus, New York Sash Vinyl Replacement Windows tilt-in for easy, inside cleaning of the outside glass. Simple! 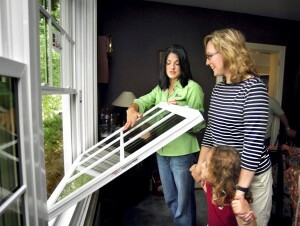 Fact #2: Today’s new windows are much safer than in previous years. Superior locks are screwed down into the frame, making these locks some of the strongest ever manufactured and innovative ideas like built-in night latches allow for even greater security! Fact #3: Today’s windows are much more cost effective. New insulated glass designs, glass coatings, and improved frame construction cut energy costs dramatically. New York Sash windows make your home more comfortable, while costing you less to heat and cool! Fact #4: They look great! Today’s windows come in a variety of shapes, styles and colors – New York Sash offers bay windows, bow windows, sliding windows, traditional double hung windows, casement windows, etc.! All of these improve the looks, design and style of any home! New York Sash Vinyl Replacement Windows are easy, energy-efficient and add curb appeal! Fact #5: Although we all want to cut costs by avoiding anything “over-priced”, that doesn’t mean it’s okay to choose your window contractor based on the low price only. This can be a BIG mistake! Low price can equal low quality, so what you initially save you’ll most likely spend later to repair the same windows or even end up replacing them again! Interested in replacing your windows with New York Sash Vinyl Replacement Windows? Give us a call at (315) 624-7344 to schedule an appointment!